Books were created to document information and communicate thoughts and ideas. The books we are familiar with today are much different than the beginnings of written documentation. As with any technology, the book has gone through many evolutions and variations and will continue to do so in the future with the advent of digital technologies. As Bolter (2001) states, “We might call each such shift a ‘remediation,’ in the sense that a newer medium takes the place of an older one, borrowing and reorganizing the characteristics of writing in the older medium and reforming its cultural space” (p. 23). 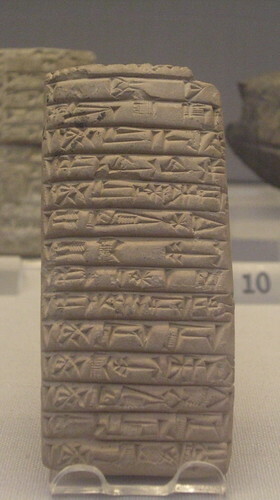 The first record of writing known to man is the clay tablet of Mesopotamia and the papyrus roll of Egypt. These examples date back to 3000 B.C. 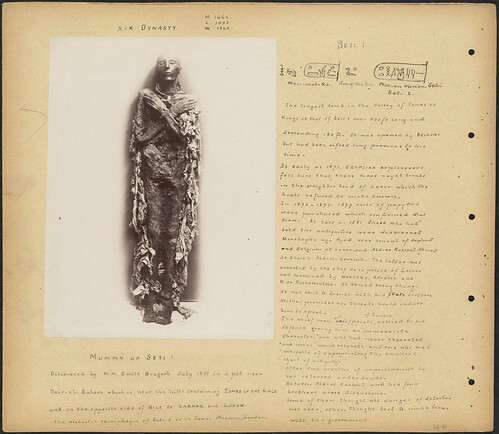 Elsewhere in the world, around 1300 B.C., written documentation was also occurring, namely in China, where books were made of wood or bamboo strips bound together with cords. The Chinese were also involved in printmaking; however, the invention of the printing press is attributed to Johannes Gutenberg (1398 – 1468) of Germany. Gutenberg used movable type that was designed to look like hand lettering to produce a Latin Bible around 1456. Gutenberg’s printing press was actually a combination of three existing technologies: paper, the winepress and oil-based ink. Therefore, his invention was not singular, but conceived of technologies that were known before Gutenberg was born. 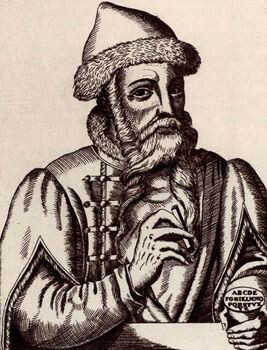 As Gutenberg refined his invention, other inventions were brought forward by Gutenberg, including the adaptation of the olive or wine oil in the screw-type press, the implementation of block-print technology and the development of certain paper techniques that could be used for mass production. 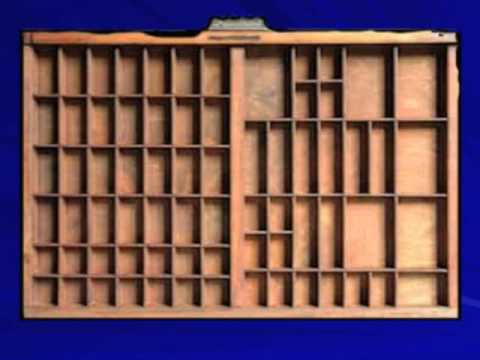 In addition, Gutenberg developed a punch and mould system that allowed for the mass production of the movable type by bringing together letters in a type tray that was used to reproduce pages of text. Robert Logan (2004) writes that, “With the printing press we finally encounter a technology whose impact on the use of the alphabet is so great that it must be ranked in importance with the alphabet itself. For not only did the printing press greatly multiply access to alphabetic texts, it also, through the regularity it introduced, transformed the way in which the alphabetic text was placed on the page and was perceived by its readers” (p. 177). Gutenberg’s printing press had an impact on society that has created a large facet of the world we know today. Although in the beginning, there was very little printing of new ideas taking place, the printing press enabled access to such texts as the Bible, which was the precursor to the preservation and dissemination of knowledge in a standardized form. This was a crucial turning point in the advancement of scholarship and critical thinking. Just as the Internet of today provides unlimited access to knowledge, the printing press truly started the “Information Revolution”. Although more and more people were literate in the fourteenth century and children of wealthy families were being taught to read, major collections of books were rare outside of the church. That being said, print put more books into circulation and as result, the regularity of spelling and conventions of punctuation enabled rapid silent reading. Harold Innis (in Logan, 2004) states, “the discovery of printing in the middle of the fifteenth century implied the beginning of a return to a type of civilization dominated by the eye rather than the ear” (p. 186). As shown in the following video, the printing press can be credited for changes in literacy, access to knowledge, schools, the spread of science, standardizing languages, nationalism, questioning of authority, individualism and democracy. As more and more books became available because of the technology of the printing press, the demand for books increased. This demand could not be met by using movable type, as that process was all done by hand and was very laborious. Therefore, during the mid 1800s, improvements were made by the invention of larger presses that could accommodate continuous rolls of paper, made by another new invention, the paper making machine. 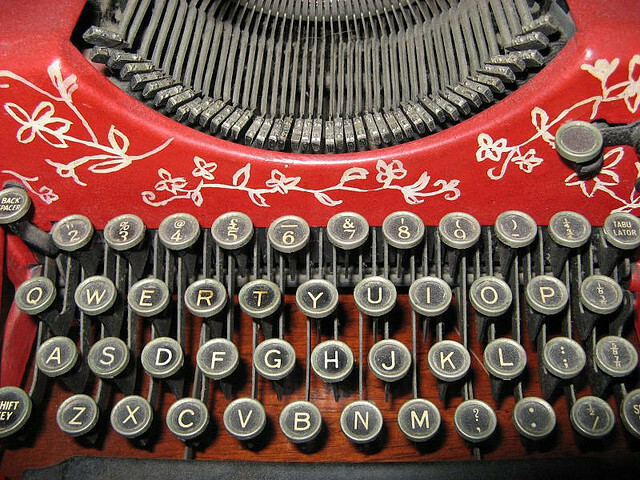 In the later decades of the 1800s, the linotype was invented which sped the up the process further as line rather than individual letters input type. As a literate society, it is extremely difficult to imagine what Ong (1982) describes as a primary oral culture, “a culture with no knowledge whatsoever of writing or even the possibility of writing” (p. 31), as we have become so accustomed to having access to the knowledge contained in books. Just as written communication has been remediated, so too has literacy, specifically reading and writing. Before the invention of the printing press and the mass distribution of books, the education to read and write was limited to a select few, usually the upper class. At this time, literacy was a special skill and was not necessary to be a productive member of society. As with any new technology there are natural consequences. In the case of the printing press, the ability to teach the masses how to read was made possible, and as a result, literacy (being able to read and write) became a necessary skill to be a more successful member of society. This holds true today. Book production, as a technology, has advanced progress towards mass literacy. Overtime, the cost of books has decreased with the production of paperback books as opposed to hard cover books, which has enabled more people to access knowledge contained in books. However, as Eisenstein (1979) states, “efforts to summarize changes wrought by printing in any one statement or neat formula are likely to lead us astray” (p. 70). Furthermore, “the fact that printed picture books were newly designed by educational reformers for the purpose of instructing children and that drawing was considered an increasingly useful accomplishment by pedagogues also points to the need to think beyond the simple formula: image to word” (Eisenstein, 1979, p. 70). The point that Eisenstein (1979) is making here is that we must be cautious about “assuming that the spoken word was gradually silenced as printed words multiplied or that the faculty of hearing was increasingly neglected in favor of that of sight” (p. 70). I would argue that as educators, in our culture, in our times, we highly value books and the information contained in them. That being said, we must also continue to value the knowledge that can be disseminated and shared from within. Just as the printing press was an agent for change in the 14th century, the remediation of technology has lead us to the Internet being our agent for change in the 21st century. Bolter, J. D. (2001). 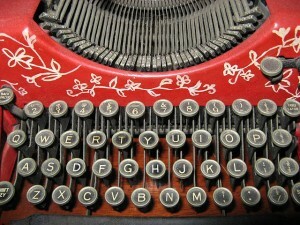 Writing space: Computers, hypertext, and the remediation of print. Mahwah, New Jersey: Lawrence Erlbaum Associates, Publishers. Eisenstein, E. L. (1997). The printing press as an agent of change. Cambridge: Cambridge University Press. [first published 1979]. Logan, Robert K. (2004). The alphabet effect: a media ecology understanding of the making of Western civilization. Hampton Press. This entry was posted in Research Paper and tagged economics, literacy. Bookmark the permalink. It was great to read about more of the development of the book after Gutenberg. You have some excellent visuals as well. Nicely done. The visuals were very interesting and it really helped to bring together the notion of the history of book production. The value of book production has definitely changed throughout the years. Nice job! Besides giving me interesting historical perspective on the economics of the book, it also made me reflect in the importance of combining visuals with texts to create a special effect on the readers.